Nestled in the Hiawatha National Forest northeast of Rapid River, visitors will find a serene and peaceful waterfall on Haymeadow Creek as well as a small campground. 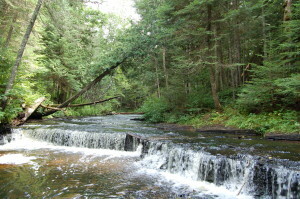 A half-mile hike through the woods leads to the falls on this popular trout stream, while the campground is one of the few in the HNF that is fee-free and first-come, first-serve. 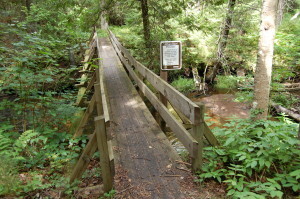 A spur trial connects to the 40-mile long Bay de Noc Grand Island National Recreation Trail – a paradise for hiking and horseback riding. 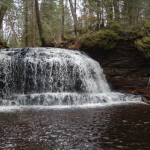 Haymeadow Falls features a drop of 2-3 feet, so it isn’t going to wow visitors with its size or power. Instead, it is the setting for this beautiful drop on the creek that makes a trip here worthwhile. 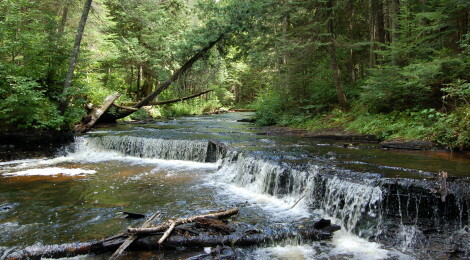 There is a good chance of not running in to other visitors on your hike back here, and the somewhat remote location of this waterfall makes it one of the most serene and peaceful in the Upper Peninsula. 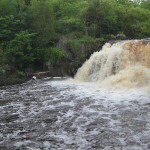 There are two trails that lead to the falls, with one starting from the campground near site #9 and the other starting from a parking area just north of the campground. 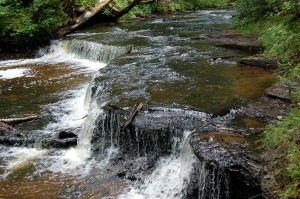 Each trail runs a half mile in length to the falls. The trail from the parking area is a bit more strenuous than the one from the campground, and sections of each trail can be muddy and difficult at times. 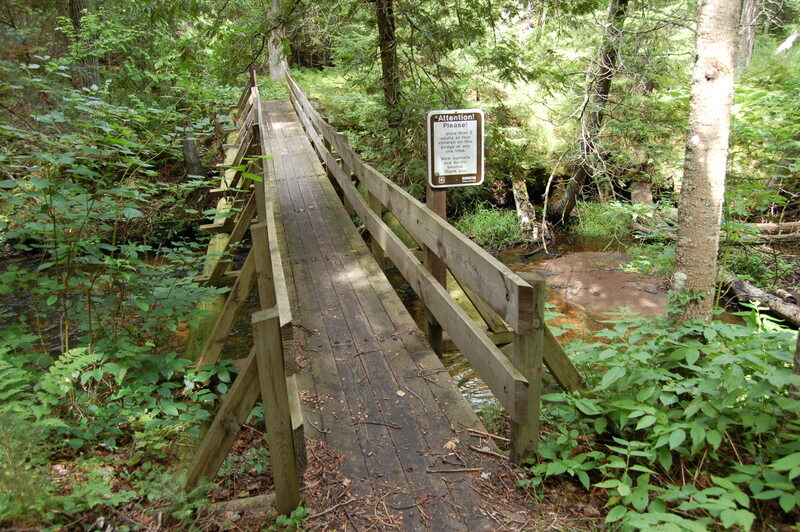 A wooden footbridge crosses the creek just below the falls. 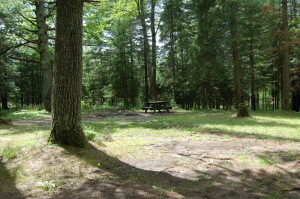 The campground features 15 sites of various sizes, all primitive with no amenities beyond picnic tables and fire rings. 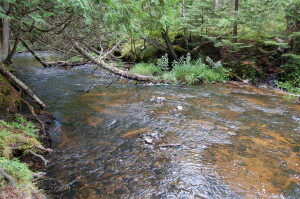 A vault toilet is located near the entrance, and a water pump is on site as well. 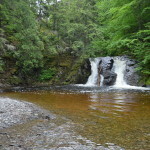 Sites are not reservable and are available to the first to arrive. 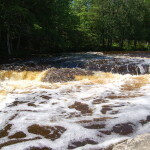 We’ve stayed here a few times, and have enjoyed the peace and quiet as well as the opportunity to get away from the modern conveniences of some of the larger communities in the U.P. Directions: On US- 2, two miles east of Rapid River, take County Road 509 north. 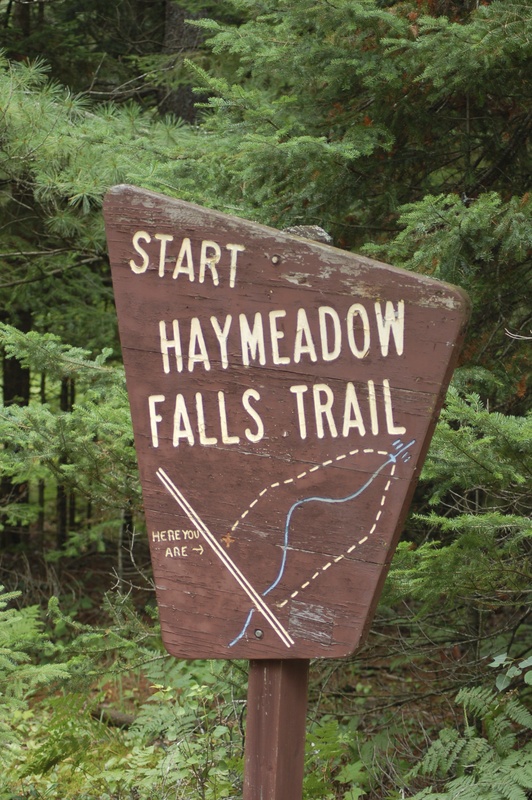 Stay on CR-509 when the road forks (bearing left). 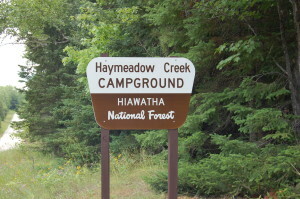 It’s a little over eight miles from this point to the campground, and there is a parking lot on the right side just after crossing the creek. 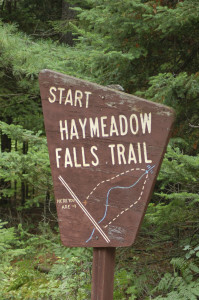 Look for the wooden Haymeadow Falls Trail signs at either point of entry.